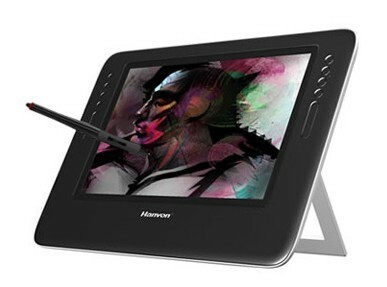 SenTIP is combined the advantages of a wide-format LCD monitor with Hanvon's patented, professional pen technology. It will bring you a completely new experience from the compatibility of the traditional painting and digital painting methods. SenTIPallows you to combine the advantages of natural hand-eye coordination and the intuitive pen-on-paper feel of traditional media with the benefits of digital workflow. SenTIP brings you an expansive working space, gives you increased control, comfort, and productivity with "pen-point" accuracy, fast cursor control, 2048 levels of pressure-sensitivity on the pen tip and eraser and the accurate orientation of 5080LPI high resolution . SenTIP builds a multi-screens environment used with the PC screens, you can not be limited in one PC screen any more, and you can work, study and entertainment freely. The pen can feel very weak pressure strength even 7g, Hanvon’s Patented Pressure-sensitive technology let you work freely and comfortably on the LCD screen like on the paper, and you won’t feel tired even when spending long hours on a computer. The ergonomic design provides intuitive grip, the tablet can be adjusted any angle you want with the dynamic, free moving stand. Thin, light and durable SenTIP with 17mm thickness can be put on your desk, in your lap comfortably like a book. Hanvon’s patented handwriting recognition technology let you control all procedures with only a grip pen but not keyboard, when painting, handwriting, or characters inputting. Design on the screen directly, appreciate the works at once. Sign and handwrite any documents in the computer directly, not only transfer and share with others easily, advance the efficiency, but also save resources and protect environments. Eight programmable Expresskeys provide quick access to modifier keys, keyboard shortcuts, and pop-up menu. Two finger-sensitive Touch Strips serve as natural ways to zoom, scroll, or change brush size, which is suit for the different using habits, left side or right side. WhiteBoard & Penmark bring us the intuitive and impressive demo. Let us edit and mark the works, documents comfortably and realize indeed automaton in teaching, meeting, training and so on. PenSign lets you leave autograph in Microsoft Office documents with pen-on-screen, and it looks just like the signature on paper. PenMail provides handwriting function for Outlook Express and Windows Mail. Users may use it to send handwriting messages. Premium wide-format 12.1" display with WXGA(1280*800)resolution .Thin and light profile with 390*270*17mm. Wide viewing angle of 170 degrees for consistent color at comfortable position and for easily sharing work with others. Patented professional pen technology with 2048 levels of pressure sensitivity and 5080 lines of resolution for enhanced workflow. High compatibility with DVI, VGA and USB connectivity. The AD integrated cable with a single line keeps your desk clean and uncluttered. * Specification subject to change without notification.